The historic Park Theater first opened in 1911, over a century ago. Movie-goers at that time were going to see silent films and vaudeville, not romping action movies with extreme special effects and romantic comedies. Unfortunately, the theater closed in 1935 -- a victim of the Great Depression, or so it seemed. After being used as a newspaper printing plant for decades, the building was purchased by Dr. Harold Kirkpatrick in 1984. Kirkpatrick intended to restore it to its former glory, spending more than twenty years and vast personal resources to rehabilitate the venue and establish it as a focal point in the community. It was re-opened in 2006, and began showing both independent and mainstream films in January 2010. Unfortunately, the theater closed again in the summer of 2014 after Kirkpatrick's passing. In July 2014, local developer Elizabeth Miller (president of Miller Mechanical) purchased the property from Kirkpatrick's family. Miller had experience renovating other buildings in the area and planned to restore the building as closely to its original state as possible. Miller planned to convert the Park Theater back into a performing arts center for use by community groups. Miller worked with architects, contractors, and even an expert who reproduced elements of the ceiling molding and other architectural details on the front of the building. In early 2017, it was announced that a restaurant would be a part of the project. In April 2018, renovations were completed, and the brand new Park Theater re-opened its doors as a hotspot for Glens Falls community events, concerts, theater, and dance. Doc's Restaurant is located in the lower portion of the building, and there are multiple spaces that can be rented out for various events. 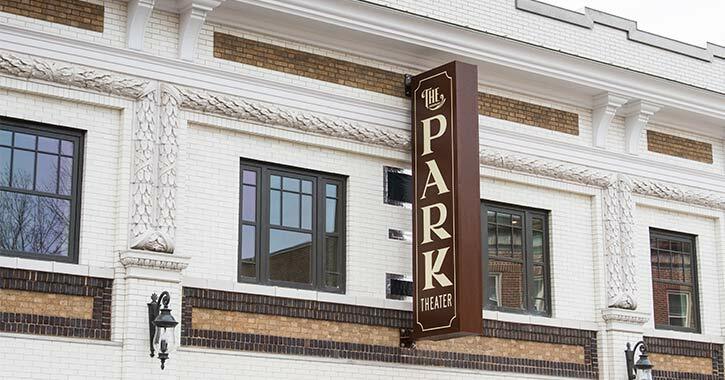 For more information or to inquire about booking the space, visit www.parktheatergf.com. The Park Theater is located at 14 Park Street in Glens Falls.